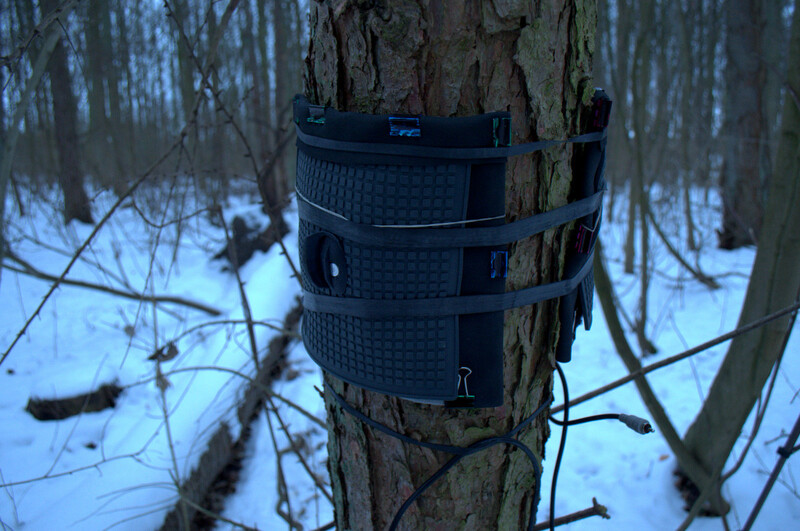 Night audio recording in the icy cold and snow covered winter forest, Brøndbyskoven 11-12th, 2017. 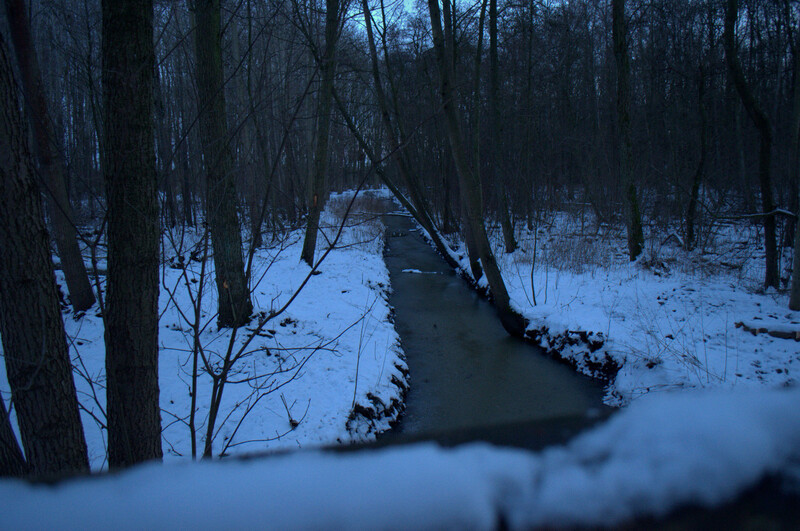 In the beginning very calm with a cold clear sky, -3C. But later, quite abruptly, it changed into more windy and cloudy conditions, and slightly warmer temperatures, 0C. Tree ears microphone setup in the evening. The microphones are pointing in the direction into the image. Road lights can be spotted ahead to the left. 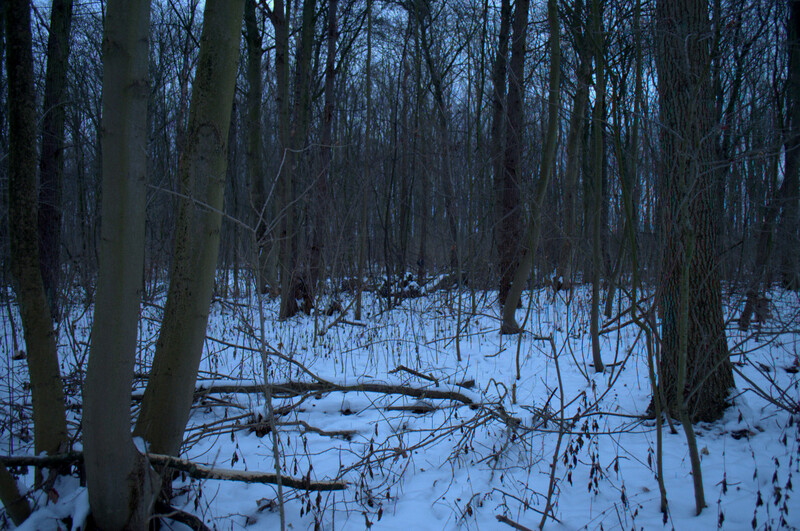 I have been curious to know if there could be any mysterious sounds in this frozen winter forest during the night. And, ok this time there weren’t any. Maybe they keep quiet when they sense a recording device in the area. Anyway such sounds are not to be expected on just any recording. I have found this winter season very quiet in terms of animal and nature sounds. Traffic and urban sounds are however the same, very noticeable. As the wind picked up during the late hours it produced some nice blows through the tree tops accompanied by steady creaking of branches and stems. I started recording around 17:30 when it was getting dark. The clip is an excerpt starting with the first 15 minutes just at the beginning of the recording followed by a segment from 3 to 4:30 am, which was the time when the wind began to pick up. 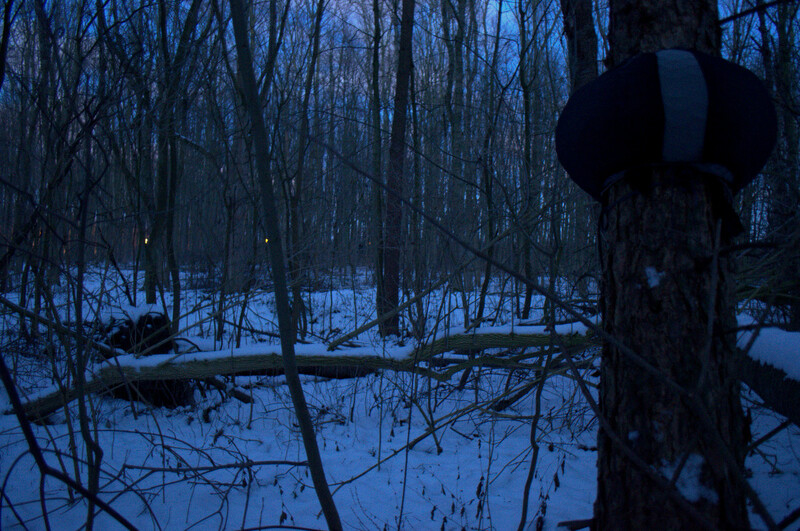 The location was not very deep into the forest, it was still possible to get a glimpse of the road lights. Despite having found a day with a good wind direction going towards the adjacent motorways, a distinct rumbling noise now turned out to come from party music pounding bass played in the residential areas. This is a factor that needs to be considered especially for Friday and Saturday night recordings. Winter conditions in Brøndbyskoven , February 11th 2017. The recording is made somewhere inside this area. 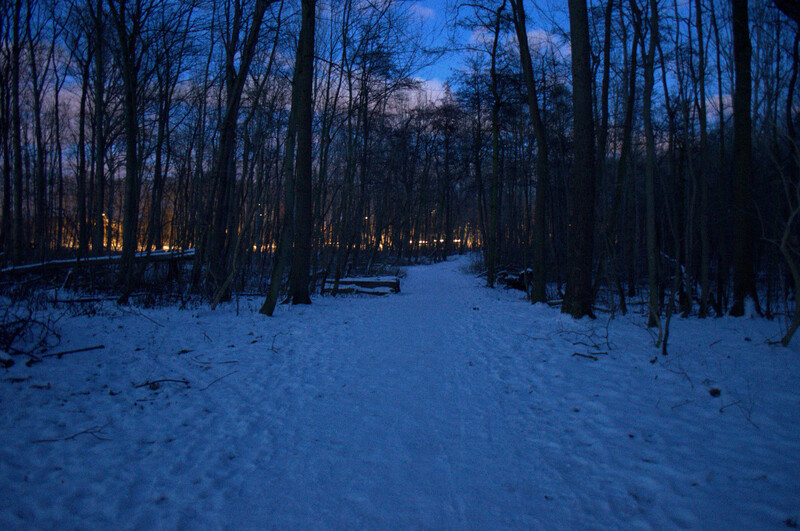 Getting very dark as I was walking out of the forest and back the road. Approaching the setup in the morning. If looking closely, the recorder can be seen as a black dot in the centre of the image. The tree ears setup as found in the morning 8 am, still recording! 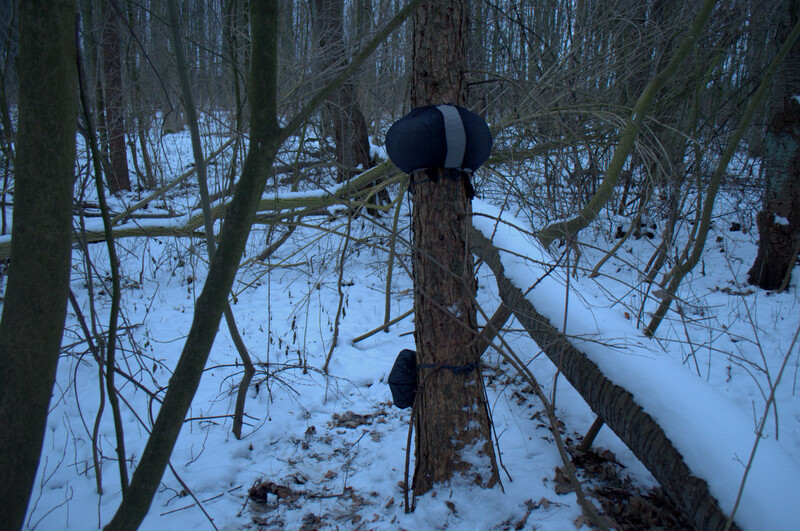 Tree ears setup in the morning, without the wind shielding.